A NASA-led team has found evidence that the oversized exoplanet WASP-18b is wrapped in a smothering stratosphere loaded with carbon monoxide and devoid of water. The findings come from a new analysis of observations made by the Hubble and Spitzer space telescopes. The formation of a stratosphere layer in a planet's atmosphere is attributed to "sunscreen"-like molecules, which absorb ultraviolet (UV) and visible radiation coming from the star and then release that energy as heat. 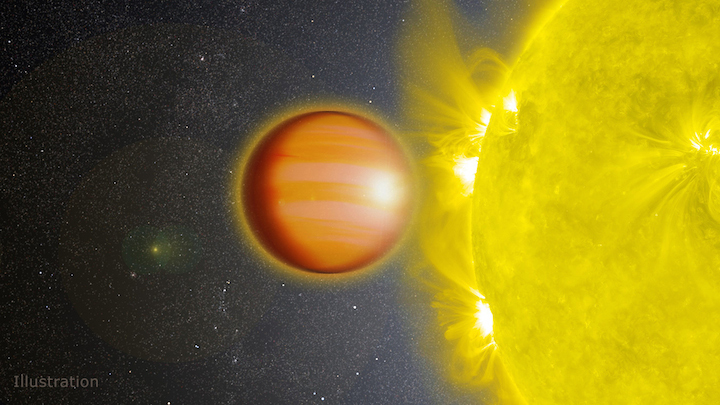 The new study suggests that the "hot Jupiter" WASP-18b, a massive planet that orbits very close to its host star, has an unusual composition, and the formation of this world might have been quite different from that of Jupiter and gas giants in other planetary systems. "The composition of WASP-18b defies all expectations," said Kyle Sheppard of NASA's Goddard Space Flight Center in Greenbelt, Maryland, lead author of the paper published in the Astrophysical Journal Letters. "We don't know of any other extrasolar planet where carbon monoxide so completely dominates the upper atmosphere." On Earth, ozone absorbs UV in the stratosphere, protecting our world from a lot of the Sun's harmful radiation. For the handful of exoplanets with stratospheres, the absorber is typically thought to be a molecule such as titanium oxide, a close relative of titanium dioxide, used on Earth as a paint pigment and sunscreen ingredient. The researchers looked at data collected for WASP-18b, located 325 light-years from Earth, as part of a survey to find exoplanets with stratospheres. The heavyweight planet, which has the mass of 10 Jupiters, has been observed repeatedly, allowing astronomers to accumulate a relatively large trove of data. This study analyzed five eclipses from archived Hubble data and two from Spitzer. From the light emitted by the planet's atmosphere at infrared wavelengths, beyond the visible region, it's possible to identify the spectral fingerprints of water and some other important molecules. The analysis revealed WASP-18b's peculiar fingerprint, which doesn't resemble any exoplanet examined so far. To determine which molecules were most likely to match it, the team carried out extensive computer modeling. "The only consistent explanation for the data is an overabundance of carbon monoxide and very little water vapor in the atmosphere of WASP-18b, in addition to the presence of a stratosphere," said Nikku Madhusudhan a co-author of the study from the University of Cambridge, United Kingdom. "This rare combination of factors opens a new window into our understanding of physical and chemical processes in exoplanetary atmospheres." The findings indicate that WASP-18b has hot carbon monoxide in the stratosphere and cooler carbon monoxide in the layer of the atmosphere below, called the troposphere. The team determined this by detecting two types of carbon monoxide signatures, an absorption signature at a wavelength of about 1.6 micrometers and an emission signature at about 4.5 micrometers. This is the first time researchers have detected both types of fingerprints for a single type of molecule in an exoplanet's atmosphere. In theory, another possible fit for the observations is carbon dioxide, which has a similar fingerprint. The researchers ruled this out because if there were enough oxygen available to form carbon dioxide, the atmosphere also should have some water vapor. To produce the spectral fingerprints seen by the team, the upper atmosphere of WASP-18b would have to be loaded with carbon monoxide. Compared to other hot Jupiters, this planet's atmosphere likely would contain 300 times more "metals," or elements heavier than hydrogen and helium. This extremely high metallicity would indicate WASP-18b might have accumulated greater amounts of solid ices during its formation than Jupiter, suggesting it may not have formed the way other hot Jupiters did. "The expected launch of the James Webb Space Telescope and other future space-based observatories will give us the opportunity to follow up with even more powerful instruments and to continue exploring the amazing array of exoplanets out there," said Avi Mandell, an exoplanet scientist at Goddard and the second author of the paper.